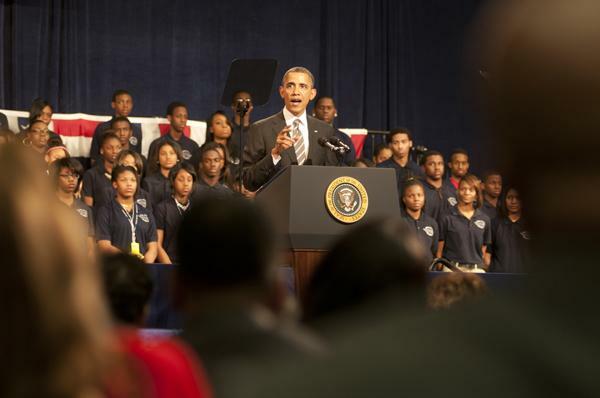 President Barack Obama speaks Friday at Chicago's Hyde Park Academy. Obama stressed the importance of strong families as a component of reducing gun violence in America. CHICAGO — President Barack Obama returned to his South Side roots Friday, calling economic opportunity and community development crucial in keeping children safe from gun violence. After much cheering, squealing and cell-phone picture-taking from the Hyde Park Academy students in attendance, Obama turned to a more somber topic: the epidemic of gun violence in his hometown. He welcomed the parents of Hadiya Pendleton, the 15-year-old Chicago girl who was shot to death in January, more than a week after singing at Obama’s inauguration. The president acknowledged the Newtown, Conn., school shooting, comparing the tragedy to the dramatic spike in Chicago homicides. “Last year, there were 443 murders with a firearm on the streets of this city, and 65 of those victims were 18 and under. So that’s the equivalent of a Newtown every four months,” he said. Evanston resident and gun-control activist Carolyn Murray lost her 19-year-old son Justin to gun violence in November. Murray attended the president’s State of the Union address on Tuesday and was invited to hear him speak in Chicago. After the speech, Murray met with Obama. She said he hugged her and extended his condolences for the loss of her son and pledged assistance to any efforts Murray starts in Evanston. Murray met first lady Michelle Obama on Tuesday, and said she also extended a promise to help Murray. Though the president insisted that “common sense” gun control measures were needed, he argued legislation is not enough to stop violence: communities and families have a role, too. In far too many neighborhoods, Obama said, youth have the impression their destiny is already predetermined. “For a lot of young boys and young men, in particular, they don’t see an example of fathers or grandfathers, uncles, who are in a position to support families and be held up and respected,” he said. Before his scheduled remarks to students and invited guests, the president spoke to students in the youth mentoring group Becoming a Man. Corey Stevens, one of the teens that met Obama on Friday, said he couldn’t stop smiling when the president walked in and called shaking his hand “just inspirational.” With so many ways to assert anger, Stevens said one of his takeaways from his visit was positive anger expression. 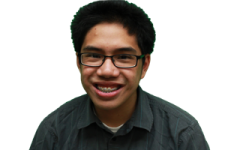 “It doesn’t have to resort to gun violence or knocking someone up the head,” the 17-year-old Hyde Park senior said. Still wearing his B.A.M. T-shirt, Stevens said the president talked about his upbringing with a single mom and how he overcame obstacles to achieve his goals. Though he initially joked that he “turned out okay” as the son of a single mom, Obama emphasized in his speech the importance of stable families in creating a safe community. The president recommended financial incentives for marriage and child support law reforms to strengthen families. “Those parents supporting kids — that’s the single most important thing,” he said, adding that “unconditional love” is what makes the difference in children’s lives. As a single mother, Murray said she worked to provide her children with strong male role models, but the absence of fathers still affects families and communities. “We’re just not seeing the stable role models in the family,” she said. Dovetailing off his State of the Union address earlier this week, Obama stressed the importance of early education. Through higher graduation rates and lower teen pregnancy rates, among other indicators, the president said $1 in early childhood education saves $7 in the future. Obama also stressed the relationship between a strong local economy and a decrease in violence. He called for an increase in the minimum wage to $9 an hour and reiterated the plan he announced Tuesday to partner with 20 of the “hardest-hit” communities in America, including Chicago. Through these partnerships, the president said he wants to reform schools, offer tax breaks for business to hire in struggling neighborhoods and address violent crime. Recalling his days as a South Side community organizer, Obama said he learned that progress takes time, initially starting at a micro level. That same mindset still applies today. “We may not be able to save every child from gun violence, but if we save a few, that starts changing the atmosphere in our communities,” the president said. When Hadiya Pendleton was in the nation’s capital for the inauguration, he said she visited the Dr. Martin Luther King, Jr. Memorial with her classmates. Obama described the memorial as a tribute to both King’s accomplishments and his perseverance during incremental change. “So in some ways, that memorial is a testament not to work that’s completed, but it’s a testament to the work that remains unfinished,” he said.